Miracle II is a unique line of non-toxic, environmentally safe products including liquid soap, neutralizer, moisturizing soap, neutralizer gel and skin moisturizer. Since 1980, thousands of satisfied users have been using the products and discovering new uses for them. With no synthetic oils, animal fat or preservatives, these biodegradable and highly concentrated products help users manage degenerative disease and environmental sensitivity. Miracle II soap can be used as both soap and shampoo and is safe on even the most delicate skin. Miracle II products make ideal cleaners, antibacterial products, deodorizers, insecticides, and fertilizers. Treat everything from colic to constipation to yeast infections and eliminate body odors with Miracle soap II products. It's a soap ... cleaner ... degreaser ... and deodorizer... all in one! Miracle II Soap cleanses your skin, your hair, and your home -- including the laundry. One of the most amazing products that has ever been presented to mankind! Most of this product is from the dust of the earth, without the drawbacks and harsh ingredients of ordinary soaps and detergents. Miracle II products are exceptionally versatile as they will clean anything that water won't hurt. They are naturally ideal cleaners, antibacterial products, deodorizers, insecticides and fertilizers. All of the Miracle II products contain no synthetic oils, no animal fat and no preservatives. They are biodegradable and naturally concentrated. Use them sparingly, as less is better. Add to your bathing routine to cleanse, detoxify, relieve muscle & joint pain and eliminate body odor. Take internally or apply topically for healing of skin problems such as acne, age spots, stretch marks & scars, bed sores, and rashes (e.g. chicken pox, poison ivy). Also very effective treating head lice and parasites. Wonderful as a shampoo and body wash for normal or oily skin and hair. By using Miracle II products you will eliminate toxic & caustic chemicals from our environment, while saving hundreds of dollars every year. After this natural soap has finished cleaning, it goes down the drain, continuing to clean up our environment. Use concentrated or diluted as required. It is strong, yet nontoxic. Commonly used soaps and lotions contain animal fat, synthetic moisturizers, deep acting surfactants, and preservatives that clog pores. Miracle II Liquid Soap opens pores that are clogged with oil. This will restore the ability to eliminate toxins, and promote the natural healing of sores and abrasions. Often used in combination with Miracle II Neutralizer or Miracle II Neutralizer Gel. This is the only product in the world that can do everything from wash a newborn baby, to clean up an oil spill and everything in between. 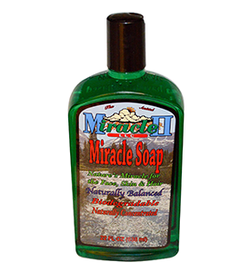 Click here to order Miracle II Soap 22 Oz.